It figures. Just when I’m about to write a scathing post regarding the latest revelations of abuse and cover-ups within the Catholic Diocese of San Diego, the Vatican goes and does something completely awesome. And by completely awesome, I mean claiming Homer Simpson as one of its own. According to Fox News, “The headline in the semi-official Vatican newspaper, the Osservatore Romano, recently read: ‘Homer And Bart Are Catholic,’ and backed it up by arguing the family prays before meals and that the show explores issues such as family, community, education and religion in a way that few other popular television programs do." Are irony and sarcasm lost on Occhetta? Or does the priest actually have a finely tuned appreciation for satire and social commentary? Regardless, this whole thing makes me want to pop some popcorn and invite the good father over to watch Sarah Silverman's Jesus Is Magic. 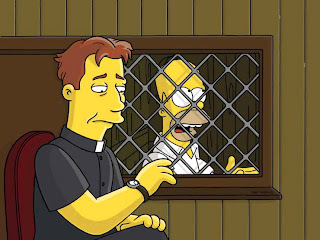 "We've pretty clearly shown that Homer is not Catholic. I really don't think he could go without eating meat on Fridays -- for even an hour." He also said the Simpson family attends the First Church of Springfield "which is decidedly Presbylutheran," and pointed out that Homer and Bart only considered converting in the 2005 episode. Aw, Al. Why can't you just play along? With the 10,000 pages of previously concealed evidence of abuse being released this week in San Diego, the church could use a little levity this week, not to mention good press. And in my opinion, the appointment of Homer Simpson as Unofficial Mascot to the Vatican would be worth the porcine cartoon character's weight in communion wafers in that regard.